Our Terms and Conditions apply to all purchases and sales of items offered here, and your purchase means you have accepted our Terms and Conditions of Sale in effect as of the date of purchase. We disclaim any other Terms and Conditions contained in any customer purchase order, order form or otherwise unless expressly agreed to by us in writing. Purchase orders must be strictly in conformity with these Terms and Conditions; inconsistent or conflicting terms in any purchase order or sale acknowledgment are rejected and shall be controlled by these Terms and Conditions unless agreed to by the customer and JUC in a separate mutual writing. Additional terms are not binding unless agreed to by an officer of JUC in a separate writing. We reserve the right to decline fulfilling orders at our discretion. Product: Prices and charges in this catalog are effective upon publication (or immediately when displayed on our website) and are subject to change without notice. All prices are quoted in MRP (Rs.). We reserve the right to pass on any surcharges or impose purchase restrictions or limits at any time. Prices and availability may vary at branch locations. 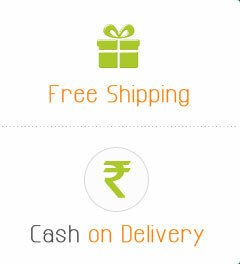 Free Shipping with in Bangalore. Net 30 days on approved open accounts from date of invoice. In addition to open accounts, we also accept cash, C.O.D. and most major credit cards. JUC has multiple payment/billing options. If an open account customer fails to make full payment within thirty (30) days from date of invoice, JUC may defer any further shipments or other orders, or cancel any portion of an unshipped order. JUC further reserves the right to charge interest on overdue invoices at the rate of 18% per annum (1.5% monthly) or at the highest rate available under applicable law. Deliveries are made Monday through Saturday, daytime hours only. JUC also uses various carriers for different regions. Items that are drop shipped directly from manufacturers may take longer, so items ordered together may not always arrive in the same box or on the same day. Title and risk of loss pass to customer on delivery to the common carrier or upon customer pickup. Orders placed on Fridays (after your local cut-off time), weekends or holidays will be shipped on the next regular business day. Please check with your JUC sales representative for more information at order time. See Warranties-Limited Liability. UPS, Fed-Ex Ground, other package carriers & Prepaid Truck Shipments (MBE MRO carrier): Check your order immediately upon arrival. All damages must be noted on delivery receipt. All shortages and damages must be called into JUC Industrial Supply at e-mailed to marketing@justusedcomputers.com within 7 calendar days.. Although all information in JUC Website has been carefully checked for accuracy, errors and omissions occasionally occur and therefore are subject to correction. We regret any inconvenience. Except as otherwise provided, no material will be accepted for return after 30 days from date of shipment. To return Product, you must call JUC at 91-7829293937 for a Return Authorization number. For Material returns or repairs, call JUC service center at 080-41127259. No returns will be accepted without a Return Authorization number. Include with your return a copy of your invoice or packing slip. Shipping charges for returned items must be prepaid. No return of altered or etched items. A re-stocking charge may be applied. Customers are required to inspect all hazardous materials deliveries prior to accepting the delivery. Unaccepted hazardous materials can be returned to JUC through the freight company that delivered the materials by not accepting the delivery. Once hazardous materials or non-hazardous materials that can become hazardous waste (e.g. broken Box) are accepted for delivery, JUC is unable to take these items back. JUC reserves the right to withdraw or amend this Website, and any service or material JUC provides on the Website, in our sole discretion without notice. MBE MRO will not be liable if for any reason all or any part of the Website is unavailable at any time or for any period. From time to time, we may restrict access to some parts of the Website, or the entire Website, to users, including registered users. •Making all arrangements necessary for you to have access to the Website. If you choose, or are provided with, a user name, password or any other piece of information as part of our security procedures, you must treat such information as confidential, and you must not disclose it to any other person or entity. You also acknowledge that your account is personal to you and agree not to provide any other person with access to this Website or portions of it using your user name, password or other security information. You agree to notify JUC immediately of any unauthorized access to or use of your user name or password or any other breach of security. You also agree to ensure that you exit from your account at the end of each session. You should use particular caution when accessing your account from a public or shared computer so that others are not able to view or record your password or other personal information. •Use the Website in any manner that could disable, overburden, damage, or impair the site or interfere with any other party's use of the Website, including their ability to engage in real time activities through the Website. •Use any robot, spider or other automatic device, process or means to access the Website for any purpose, including monitoring or copying any of the material on the Website. •Use any manual process to monitor or copy any of the material on the Website or for any other unauthorized purpose without our prior written consent. •Use any device, software or routine that interferes with the proper working of the Website. •Introduce any viruses, trojan horses, worms, logic bombs or other material which is malicious or technologically harmful. •Attempt to gain unauthorized access to, interfere with, damage or disrupt any parts of the Website, the server on which the Website is stored, or any server, computer or database connected to the Website. •Attack the Website via a denial-of-service attack or a distributed denial-of-service attack. •Otherwise attempt to interfere with the proper working of the Website. JUC's product cross-reference results do not imply that all products compared are of functional equivalency or that performance and other characteristics are exact. For critical applications, review specifications prior to purchase. The information available on this Website is the property of JUC and its suppliers and is protected by copyright and other intellectual property laws. All rights not expressly granted under this Agreement are hereby reserved by JUC. No act of downloading any portion of this Website will constitute a transfer of title in such material. Any printouts using or referencing content from this site, with the purpose of evaluating or acquiring JUC’s products or services, shall contain JUC's copyright notice. No other permission is granted to you to copy, reproduce, distribute, republish, transmit, upload, download, display in public, or modify the content contained on this Website. The trademarks, logos and service marks ("Marks") displayed on this Website are the property of JUC or other third parties. Users are not permitted to use these Marks without the prior written consent of JUC or such third party which may own the Mark. Although MBE MRO has attempted to provide accurate information on the Web Site, JUC assumes no responsibility for the accuracy of the information. JUC may change products or services mentioned at any time without notice. YOUR USE OF THE WEBSITE AND ITS CONTENT IS AT YOUR OWN RISK. ALL INFORMATION PROVIDED ON THIS WEB SITE IS PROVIDED "AS IS" AND "AS AVAILABLE." JUC AND ITS SUPPLIERS DISCLAIM ALL WARRANTIES, EXPRESSED OR IMPLIED INCLUDING, WITHOUT LIMITATION, THOSE OF MERCHANTABILITY, FITNESS FOR A PARTICULAR PURPOSE AND NONINFRINGEMENT OR ARISING FROM A COURSE OF DEALING, USAGE, OR TRADE PRACTICE. WITHOUT LIMITING THE FOREGOING, NEITHER JUC NOR ANY PERSON ASSOCIATED WITH JUC MAKES ANY WARRANTY OR REPRESENTATION WITH RESPECT TO THE COMPLETENESS, SECURITY, RELIABILITY, QUALITY, ACCURACY OR AVAILABILITY OF THE WEBSITE, OR THAT THE WEBSITE OR ITS CONTENT WILL BE ACCURATE, RELIABLE, ERROR-FREE OR UNINTERRUPTED, THAT DEFECTS WILL BE CORRECTED, OR THAT THIS WEBSITE OR THE SERVER THAT MAKES IT AVAILABLE ARE FREE OF VIRUSES OR OTHER HARMFUL COMPONENTS. Copyright © 2015 Justusedcomputers, All Rights Reserved. Powered By: JSA Web Solutions.